An open-source hardware group on Monday announced a US$89 credit-card sized motherboard based on an ARM processor that could be used for robotics, gaming and medical devices. BeagleBoard's BeagleBone development board is targeted at the open-source hardware community, which includes hobbyists and engineers writing code for hardware with open-source specifications. Some BeagleBoard projects include bringing Linux-based Android and Ubuntu operating systems to its hardware. 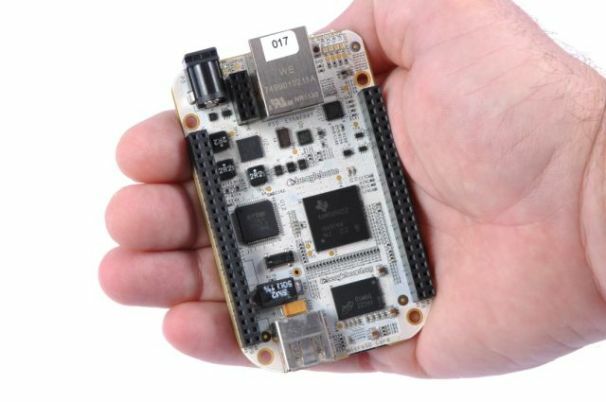 The BeagleBone runs a full version of Linux and a full-featured web server, BeagleBoard said in a statement. The board is based on Texas Instruments' $5 Sitara AM335x ARM Cortex-A8 processor, which can deliver 720MHz of performance. TI announced the processor on Monday. The board may not be for use in smartphones, tablets or PCs, said Jim McGregor, chief technology strategist at In-Stat. It is mostly for embedded systems running specific applications, and could also be used in audio-visual systems and projectors. One device developed around the board is the Smart Pill Box, which is a device that lets off an alarm at a specific time to remind Alzheimer's patients to take medicine. The open-source boards are cheap to implement, and a lot of development is based on the ARM processor and Linux OS, McGregor said. Decades of development around Linux for open-source hardware has created some easy-to-implement applications for devices. Despite some experimentation, open-source hardware may not reach smartphones and tablets soon, McGregor said. Hardware requirements for those devices are much more demanding and dynamic, and devices makers prefer to implement their own chip designs. But the possibilities are exciting, and some of the latest chips from companies like Qualcomm include the latest graphics and communication capabilities, McGregor said. Other open-source projects include OpenCores, which hosts open-source processing cores, the microcontroller-based Arduino, and Bug Labs, which offers hardware for devices such as wireless devices and cameras. The BeagleBone measures 3.4 inches by 2.1 inches (8.6 centimeters by 5.3 centimeters). It has Gigabit Ethernet, 3D graphics, USB 2.0 and microSD controllers, BeagleBoard said.